Developers hope to keep travelers entertained enough to stay in their own newly expanded ski town rather than head to its nearby, more glamorous rival. As the largest of the four ski areas owned by Aspen Skiing Company, Snowmass has always been the crowd-pleaser in terms of terrain among the portfolio, which includes Aspen Mountain in the town of Aspen, 9 miles away, and, between them, Aspen Highlands and Buttermilk. But Snowmass lacked a central base village that was diverting enough to keep travelers entertained in the area during post-ski-lift hours. This winter, that has changed with the opening of a $600 million development, the newly expanded Snowmass Base Village, which its developers hope will make Snowmass a destination to rival nearby Aspen. At over 3,300 acres, Snowmass offers diverse runs, from easy to expert. 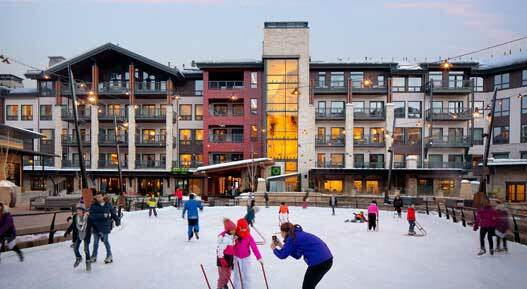 Slopeside hotels and condominiums tout hassle-free ski-in, ski-out access, which appeals to families. A shop-lined pedestrian street about 500 feet uphill from the express ski lifts has long served as an access point, but often empties out after a few après-ski hours. The new base village, at the mountain’s ski-lift nexus, is designed to stanch that outbound traffic flow by building a more well-rounded hub for visitors to recreate and socialize. It includes a new hotel, the relatively affordable Limelight Hotel Snowmass with 99 rooms, two large outdoor hot pools and live music in the lounge five nights a week (rooms from $159). A new community center called the Collective Snowmass offers a mix of storytelling sessions, art exhibits and yoga classes. The centerpiece public plaza adds an ice rink, firepits, an indoor climbing wall just inside the Limelight building and a smattering of ski shops and restaurants. The new village doesn’t stray from Snowmass’s strength as the family-friendlier of the Aspen ski area options. The Limelight lounge off the lobby, for example, has a children’s area with foosball, floor pillows, board books and old-school video games like Pacman, allowing parents to keep an eye on the kids while also listening to live music in the lounge. The free skating rink offers skate rentals from a vintage 1958 Airstream trailer. The five-story climbing wall was designed to mimic some of the climbing routes on Independence Pass in the area. “It’s realistic to outdoor climbing,” said Sammy Podhurst, a guide at the unaffiliated adventure outfitter Aspen Expeditions Worldwide who tested out the wall a few days after it opened. “It feels like a real crack climbing route,” she added, referring to a difficult route in which climbers jam their hands and feet into rock cracks as they ascend (beginners’ routes are also available). The additions expand other on-mountain adventures that were recently added to diversify Snowmass’ non-ski offerings. They include the year-old Breathtaker Alpine Coaster, an elevated roller coaster where sleds whiz up to 28 miles per hour through the pine forest. Dining options are still limited at Snowmass, though improving. The Crepe Shack by Mawa’s Kitchen, the third of a mini-chain of restaurants run by Mawa and Daniel McQueen, recently opened next to the base village ice rink, offering hearty crepes that are more like sandwich substitutes than knife-and-fork desserts with fillings like chicken and pesto ($12.95) and a few luxe options including smoked salmon and caviar ($120). The new base village also draws attention to one of its earliest entries, the Viceroy Snowmass resort, home to a full-service spa, the Latin restaurant Toro Kitchen & Lounge from the chef Richard Sandoval and a new ski-up bar adjacent to the Assay Hill run. Opened in 2009, the luxury hotel remained isolated when the deal to build out the rest of the base village fell victim to the recession. The project changed hands before East West Partners, which had previously built ski villages at Beaver Creek in Colorado and Northstar California Resort at Lake Tahoe, joined KSL Capital and Aspen Skiing Company in taking up the project in December 2016. A few condo buildings remain under construction and the entire project has a more modernist feel — with slanting rooflines and lots of glass — than many Alpine-style villages in the Rockies that tend to copy European chalets. For those seeking any non-resort-related life in Snowmass, the nonprofit Anderson Ranch Arts Center is just a few minutes’ drive from the base area. Opened in 1966, the 4.5-acre compound offers artist residency programs, self-guided tours and, in summer, over 150 arts classes in mediums including photography, ceramics and woodworking. Recent residents have included the filmmaker Steve McQueen and its lecture series last summer featured the Chinese artist Ai Weiwei. More restaurants yet to come may help keep Snowmass visitors in place. But for now, Aspen is still a compelling neighbor for shopping and nightlife. Fortunately, free shuttle buses run between the two destinations about every 15 minutes from early morning until after midnight.